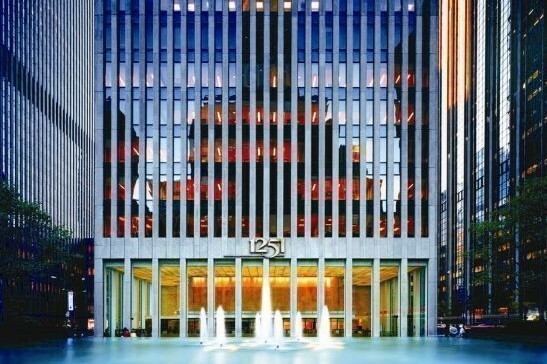 Mitsui Fudosan America announced that Waterfall Asset Management,, an institutional asset manager, is relocating and expanding to 1251 Avenue of the Americas, taking the entire 50th floor. The deal brings the building to 99 percent occupancy after the recent full-floor global headquarters lease signed with the International Council of Shopping Centers. Waterfall will occupy 44,100 s/f in the 54-story, LEED Gold certified office tower. The move to MFA’s flagship property is expected in the third quarter of 2019 for an 11-year term. “We are thrilled to welcome yet another distinguished tenant to 1251 Avenue of the Americas,” said Christopher N. Perez, senior vice president of MFA. Waterfall is relocating from 1140 Avenue of the Americas, where it had occupied two floors totaling 25,500 s/f. The firm preferred a full floor rather than taking a third one in its current location. “1251 Avenue of the Americas is the perfect location for Waterfall,” said Jack Ross, one of the founding partners of Waterfall. “Mitsui Fudosan America has continually invested in building upgrades and improvements, earning 1251 the reputation of being one of New York City’s best managed office towers,” said NKF’s David Falk, who represented MFA in the transaction. Sixth Avenue remains one of the most sought-after locations in midtown Manhattan with 1251 as one of the marquee buildings. Among the tallest on the avenue, 1251 features column-free floorplates and full-height windows. It has a meticulously landscaped plaza that includes a two-tiered reflecting pool, which is the largest fountain in Manhattan. Early next year, the owner will redesign the lobby and upgrade the elevator system which, combined with several new restaurants, will further strengthen the property’s standing as a Midtown stalwart. “1251 Avenue of the Americas sets the benchmark for Class A office space along the Sixth Avenue corridor,” said Perez. MFA is seeking best-in-class tenants for Floors 37 and 38, which will be available in 2019, and is the first contiguous block offered in the building since 2010. The cumulative square footage is 85,600 square feet. JLL’s Chris Kraus and Daoud Awad represented the tenant. NKF’s Falk, Peter Shimkin, Eric Cagner and Nick Berger represented MFA.